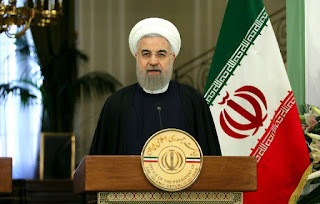 TEHRAN: Iran said Thursday that new US sanctions were a violation of its nuclear deal with world powers, piling pressure on President Hassan Rouhani as he started his second term. Rouhani was sworn in by supreme leader Ayatollah Ali Khamenei later in the day following his re-election in May. It comes less than 24 hours after US President Donald Trump confirmed fresh sanctions against Iran. Tehran says the new measures violate its 2015 deal with world powers that eased sanctions in exchange for curbs on its nuclear programme, an agreement which Trump has repeatedly threatened to tear up. The mounting crisis creates a difficult position for Rouhani, a 68-year-old moderate who won re-election largely thanks to his efforts at repairing relations with the West. “It’s unfortunate timing,” said Ellie Geranmayeh, an Iran analyst with the European Council on Foreign Relations. “What will be absolutely critical is how the Europeans position themselves,” she said, pointing to the burgeoning trade ties with Europe and their continued backing of the nuclear deal. Britain, France and Germany - who signed the deal along with Russia, China and the United States - remain firm backers of the agreement and have criticised the Trump administration for threatening to scrap it. French energy giant Total defied US pressure in July by signing a multi-billion-dollar gas deal with Iran. “What Iranians are banking on at the moment, maybe overestimating, is that Europe will safeguard and build on the deal, and make it too politically costly for Trump to tear it up, or at least show Washington that if it walks away, it will be doing so alone,” said Geranmayeh. The International Atomic Energy Agency has repeatedly certified that Iran is sticking by its commitments under the agreement - a position that has been reluctantly accepted by the Trump White House. But with Iran gaining the upper hand across the Middle East, through its support for proxies in Syria, Lebanon and Iraq, US lawmakers appear determined to ratchet up tensions. Meanwhile, Rouhani also faces challenges closer to home, with hardline opponents arguing that Washington’s aggressive moves prove that he should never have trusted the United States. A war of words also erupted between Rouhani’s office and the Revolutionary Guards after he criticised their role in the economy - although they have since sought to bury the hatchet with a public show of unity. This week, Rouhani’s reformist allies also joined the chorus of criticism, lashing out at news that he would again appoint an all-male cabinet. Much of Rouhani’s popularity has been built on his promise of greater civil liberties, including more rights for women, but Iran has still had only one female cabinet member since the 1979 revolution - ironically under hardliner Mahmoud Ahmadinejad. The government line-up is due to be officially unveiled on Saturday at a high-profile inauguration ceremony in parliament in the presence of foreign guests, including EU foreign policy chief Federica Mogherini.